There is something absolutely heartwarming in the first reading we hear year after year, supposedly one of the oldest poetic pieces in the Bible, uttered by Moses to Aaron and his sons. It warms the heart not only because in it we find a threefold blessing, but also because the name of the “Lord” (Yahweh) is mentioned directly in as many times. Here we are face to face with an image of God as nurturing, caring, life-enabling, intimate, protective, warm, gracious, kind and solicitous … in short, an image of God, not only as Father, but also as Mother. Not too often do we get to hear reflections revolving around the idea of God as both paternal and maternal. In this world that emphasizes a whole lot of distinctions between black and white, east and west, north and south, rich and poor, women and men, old and young, the haves and the have-nots, the powerful and the powerless, male and female, Jew and Greek, believers and Gentiles, etc … we tend to see reality, including God Himself, in terms of clearly delineated categories. We forget that parenthood per se, which encompasses paternity and maternity really finds integration in the commonalities that make parenthood what it essentially is: nurturing, caring, life-enabling, facilitating, empowering, and growth enhancing presence! Presence! This is an apt word to sum up the riches of today’s liturgy in honor of the Blessed Virgin Mary, Mother of God! Presence is essentially what the threefold blessing we heard today (and every year at New Year’s Day Mass). I have it on the authority of so many psychologists and researchers that even on the human plane, the warm, nurturing, caring, secure presence of the first “object” a child relates to – the mother – assures the child of getting a “secure base” from which to launch his or her relational personhood to life, to the world, to others and to self! Healthy personhood starts out on a basic sense of healthy attachment to a parent figure, particularly the mother. The people of God, led by Moses and Aaron, was just a newly born community as they went for their journey of salvation in the desert. They were a fledgling infant struggling to find themselves a niche in the promised land which was at that time, nowhere near and within arm’s length. They were immersed in all the uncertainties of a desert, nomadic existence for all of 40 years! They were, for all intents and purposes, suckling babes dependent on the graciousness, kindness and enabling presence of their Lord and God. That presence was made into palpable reality through Moses and Aaron. That heartwarming presence assumed concrete expression in the threefold blessing that was uttered by Moses. The presence of God was mediated by God’s messenger, God’s prophet, God’s emissary to His beloved people. The “birthing” of God’s kindness and graciousness, of His refulgent face, of His peace, came through the mediation of Moses’ ministry as prophet. Let us try one such duty of ours for size. Moses’ threefold blessing to Aaron and his sons, ultimately, referred to just one reality. They all referred to things that make life worth living – the palpable presence of God looking down kindly on me, on you, on us all, on all nations! And that caring, nurturing, enabling presence will then lead to peace, gracious peace, peace that represents absolute well-being in its wholistic, total sense. Here is where we all could use some introspection. How much facilitative are we of peace? How much of peace indeed shines in our face and total countenance? At the beginning of this new year, are we a picture of confident, hopeful enthusiasm, or are we the epitome of angry, cynical, and hopeless pessimism? 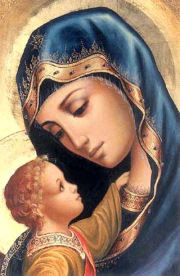 Are we giving birth to hope or are we becoming the efficient, instrumental cause of people’s discouragement, of their losing trust and faith in a God who looks so graciously and kindly on us now in and through the loving countenance of a woman we now call Mother of God, Mother of Christ and Mother of us all? To push the image a little further … how much of a prophet have we been in the past year? How have we given birth to new and committed believers by our mediating, nurturing, evangelizing presence? How much effort have we placed on spreading the Good News to others? The late Holy Father, Venerable John Paul II, as early as 1979, has been talking about the need for new evangelization. Among others, this means the “birthing” again, of a new impetus, a new drive, a new fervor, shown in new methods of bringing Christ and his good news to others. This may well be just the answer many people need to get to make their life worth living. Mary our Mother did just that. She went in haste to Judea, not only to help her cousin out in her hour of need. She brought the “good news” she was carrying in her womb, and no less than his precursor felt and “saw” that presence. The baby leapt in Elizabeth’s womb for joy. Mary, Mother of God, and Mother of us all, guide us with your caring presence that we may also become in turn, what you were – first to be evangelized, you became also the first evangelizer. May we be, like you, mediated blessings from God that make life worth living.